I was in Canada for Christmas and Quebec for New Years. Montreal, to be precise. I was on holiday and tried my best to not lug a big old camera around and instead enjoy the company of my friends. I had a brilliant time. Nevertheless, I did catch this purple goodness outside of a bar on New Year's Eve... okay, more like early New Year's Day. A have a few more shots I'll post soon. What do you mean you were in Canada on Christmas and in Quebec on New Years? Quebec is in Canada!! It's a Canadian province! I really like this- looking at the snow and ice and how people manage to do what they want to do despite the cold. I'm from Australia, and we almost never see these types of conditions (although we are suffering from torrential floods at the moment in Queensland, one of our northern states). Never again will I complain about riding from my house into the Melbourne Central Business District (Victoria, Australia) in the winter because the temperature is 10C! Juillet - bit of a hornet's nest being opened there. Many Quebecers see themselves as a nation in their own right. Maybe Mikael is just respecting this. If someone said they were in the UK for New Year, when they were in Edinburgh, then we in Scotland would be a bit miffed. Similar idea. It's only a minority of Quebecers want to be separated and the thought of separation hasn't come up for a while. It's kind of disrespectful to suggest Quebec and Canada are two different nations...and this is coming from a Montrealer. Why bring the political crap into a bike blog? But back to bikes, I'm surprised you had the luck to find what you did! Winter biking is still a quite rare thing to see in Montreal, far from something a large part of the population do. Even when the weather is mild and pleasant like it was this New Years... The powers that be still haven't come around to thinking of bikes as more than a summertime recreational alternative to moving by car. The Bixi service is not year-round: the bikes are removed in the late fall, not to be brought back until there is no more likelihood of snow in the spring. Thanks Paul. You got it. Kiwehtin, what the heck? Tell me why the "rest of Canada" call themselves the ROC? There's no faux distinction. It's obvious. Nice shot by the way Michael. I have never heard a Quebecer say they're going to Canada when they take the train to Ottawa or fly to Vancouver! We're more geographically and politically astute than that. Nice shot though and keep up the great work. "Rest of Canada" w.r.t. Quebec. Not "Canada" as opposed to Quebec. Of course, "Rest of Canada" is just as accurate when you're in Alberta, say, and talking about all the other (generally less right-wing) provinces, including Quebec. That is also obvious. And that there are many in this province who consider themselves a separate nation is moot. The country is Canada, period. Quebec is not a distinct historic country like Scotland, Wales, Corsica or Brittany (or, indeed, Newfoundland), nor a historically, culturally and linguistically distinct territory like Occitania, Piemont or the Catalan countries. French Canada extends beyond Quebec and English Canada within Quebec is as significant as the populations of many other provinces. Remember that the majority in this nation consider that Quebec should be treated as a province equal to all the others in all ways. And the majority should rule then, no? Again Mikael, you should be careful about walking into this minefield. It may be fashionable in certain quarters to pick on Canada and support Quebec nationalism while, for whatever unfathomable reasons, blithely accepting as single, unassailable "nations" places like France, Italy or Spain that have systematically denied cultural and linguistic rights to their minorities. Canada doesn't deserve this disrespect, and Quebec nationalism (unlike Flemish, pan-Catalan or Occitan nationalism) doesn't deserve this kind of flattery. Sorry this is off topic, but writing as if Quebec is something different from Canada is also off topic and an entirely unnecessary and undeserved insult to the many Quebeckers who are patriots and to other Canadians, in a country that has bent over backwards to respect the French language in a way that would be unthinkable for many European countries to do for their own linguistic minorities. Sorry, but you're out of your depth here. I will argue against this opinion, with the same insistence on all the facts and ethical principles as I have argued supporting you on the foolishness of the helmet cult over the years. What a shot!!! Love it. 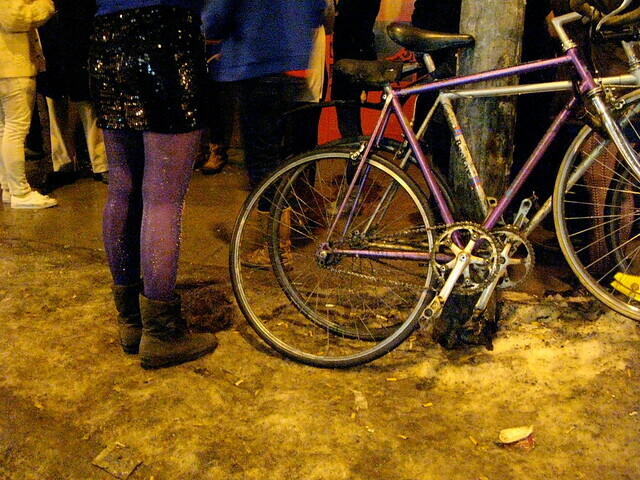 Of course, it does pose the existential question: which came first the bike or the tights? Love your blog. This Fall in Texas, USA, we were having 90+F; I cooled off checking your blog for wintery pics. Fashion and snow kept hope alive. Thanks. Love your blog! And happy to see you've passed by my hometown! Montreal is a big Biking city too! Keep up the good work! Thank you Mikael. Cripes, even Stephen Harper (as well as the social-democratic NDP, and I think nowadays even the very centralist Liberal Party) recognise Québécois nationhood. That does not entail that we need or want to be a sovereign state. Québec is definitely a historically distinct nation (Kiwehtin, there are French-speakers in Italy and German-speakers in Belgium) whether or not we opt to remain within the Canadian state. Kiwehtin, both indépendantistes and federalists are patriots: they are simply patriots to different entities. (And some of us, myself included, have a lot of misgivings about any type of patriotism, though I'll always choose the smaller and more downtrodden group over the larger - hence Québec over Canada but Indigenous nations over Québec). I think you are extremely insulting to deny our nationhood and history, whether or not you prefer a continuation of the existing federal system. Back to bicycles: actually far more people cycle year round now than twenty years ago. But increasing modal share further will require continuing the struggle for more bicycle paths and priority to cleaning them with our cute little chenillettes. Vive la vélorution! Vive le Québec cycliste!